Flo Golden South Moment #1: Wyatt High School Breaks National Record! Watch Flo Golden South Live on MileSplit. 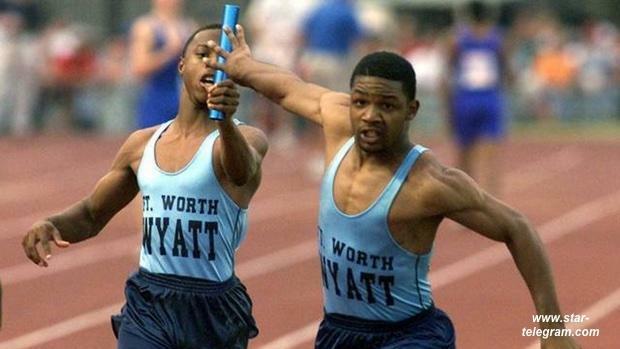 Our top moment in Flo Golden South history comes from Wyatt High School in Texas who set the 4x200m national record of 1:23.31 in 1998. Before the internet allowed the sharing of race videos with the click of the button, sports rivalries relied on good, old-fashioned, head-to-head racing to show who was best. When the Fort Worth, Texas, squad from Wyatt High School landed in Orlando for the 1998 Flo Golden South, they were already history-makers. The foursome of Monte Clopton, DeMario Wesley, Milton Wesley and Michael Franklin were the first group of schoolboys to break 40 seconds in the 4x100m, and did it twice: at the Texas regional and state meets with a new national high school record of 39.76. "People didn't believe we ran 39," DeMario Wesley said to Buddy Collings of The Orlando Sentinel. "We wanted to show that it was no joke." The quartet again broke 40 seconds at Golden South, with what still stands as the No. 5 all-time clocking of 39.82. Wyatt owns five of the top seven all-time marks in the 400m relay. But their greatest moment that day at Golden South came in the 4x200m relay, where they shattered the national record with a new mark of 1:23.31, thanks to splits of 21.4 (Clopton), 20.0 (D. Wesley), 21.2 (M. Wesley) and 20.7 (Franklin). Wyatt High School still holds the national high school record in the 4x100m but their 4x200m record fell to the Woodlands who ran 1:23.25 at the UIL Track and Field Championship just one week ago.